In trying to do too much, White Boy Rick accomplishes too little. During the course of less than two hours, it seeks to be a character drama, a true-life crime saga, and a socially conscious commentary about the disproportionately long sentences mandated for nonviolent drug crimes. Lack of focus is ultimately the undoing of sophomore feature director Yann Demange – despite crafting several compelling stand-alone sequences, he is unable to stitch everything together into a compelling whole. White Boy Rick is all over-the-place and its discontinuities make it difficult for a viewer to settle into the story. 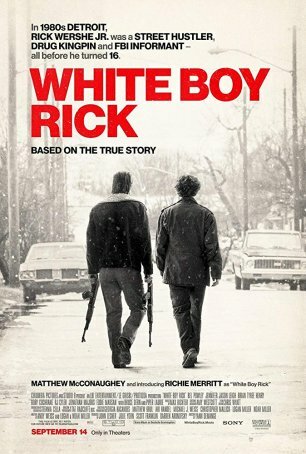 White Boy Rick is based on the true-life tale of a 15-year old boy, Rick Wersehe Jr. (Richie Merritt), who is used as an undercover drug dealer and informant for the FBI. Following a gang-related shooting, Rick is cut loose by the Feds and starts selling on his own. Aided by his always-eager father, Richard (Matthew McConaughey), “White Boy Rick” becomes a major force in Detroit’s drug infrastructure until the cops decide to pull the rug out from under him. Because the amount of product in his possession exceeds the legally permissible limit for clemency, he faces a sentence greater than that of many violent criminals. In addition to being hurt by a script that lurches forward erratically, White Boy Rick is hampered by an inconsistent depiction of time and place. Perhaps intentionally, Detroit feels like a generic crumbling city. It has no character beyond being a drug-infested haven for crime and poverty. Likewise, Demange has a tenuous grip on the time period. His vision of the mid-1980s (the story spans 1985-87) is about five years out of synch. The look and feel are more appropriate for the late 1970s. The music is generic-sounding disco-pop from the post-Saturday Night Fever era (the budget apparently didn’t allow for the filmmakers to use recognizable songs). A 1986 clip from the TV show “General Hospital” is actually from 1981. White Boy Rick’s least compelling character is the title one. Underplayed to the point of woodenness by newcomer Richie Merritt, Rick invariably seems like the dullest person on screen unless he’s alone. It’s hard to say whether the fault is his or the director’s. Other actors fare better. Despite getting top billing, Matthew McConaughey is in a supporting role. This isn’t his best performance but it’s one of the better things in the movie. Bel Powley, portraying Rick’s junkie sister, Dawn, steals every scene she’s in. This isn’t the first time Powley has impressed – she was excellent in The Diary of a Teenage Girl and easily the standout in the mediocre Wildling. Dawn is a tragic figure and, while watching White Boy Rick, it occurred to me on more than one occasion that the movie would have had more potential had it been about her.